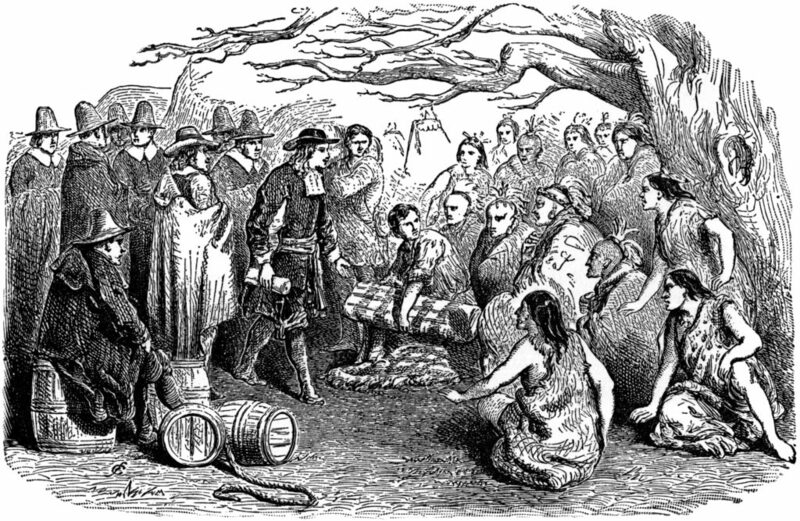 The Lenni Lenape Indians were the earliest inhabitants of what is now called Durham. Archeologists found much evidence of their prehistoric existence here. To the Lenape what we know as Durham Village, they called “PECHOQUELON.” When the Europeans first arrived they found this Lenape “town” and their chief whose name was “GACHGAWATCHQUA.” They also were aware of the “iron in the hills” that the Lenape had been using to make implements and for trade with other tribes along the eastern seaboard. A powerful syndicate was formed in London, England called “THE FREE SOCIETY OF TRADERS,” to investigate and develop these mines amongst other things. William Penn conferred power and privilege upon this group, which was unprecedented at the time. Officers of Penn’s Holy Experiment were not to interfere in its operation which was to establish factories, transport tradesmen and artificers, manumit slaves after fourteen years of service, etc. Five thousand acres of the grant of 1682 were surveyed prior to the close of the century and located under the name of DURHAM, which comprised the whole of what is today Durham Township plus a large part of Northampton County. The setting of land far from the burgeoning areas of Bristol and Philadelphia which could have been purchased for equal cost and been closer to the population centers in those areas should make it clear that it was not agricultural reasons for Durham, but rather “iron” and potential profit when the ore was removed and smelted. Interestingly enough, it was the iron furnace and the raw ore found in the hills of Durham that brought Europeans here much earlier than to the surrounding townships, and that ownership of the land by the “FREE SOCIETY” and its successor, a stock company, precluded Durham’s formulation as a political entity—a township. Durham’s neighbors to the west, Springfield, became a township in 1743, Plumstead in 1725, Bedminster in 1740, Haycock in 1763, Tinicum 1747, Nockamixon in 1746, but Durham did not become a township until 1775. The image is a facsimile of a “Patent for one hundred and one acres of land in Durham Township,” (which today covers just under 6000 acres) “with some mining rights granted by John, Thomas and Richard Penn to Jacob Trelly for 15 pounds, 13 shillings and one penny and An annual quit rent of one half penny sterling for each acre. To be brought to Pennsbury Manor on March 1 of each year.” The deed was recorded in Philadelphia on February 17, 1743. The framed facsimile print was presented to the Durham Historical Society by Bucks County Commissioners during a visit to Durham in 2005. It hangs in the Historical Society office in the Durham Mill building. The Durham Furnace did not produce appreciable iron or iron products for world wide consumption. Transport to Philadelphia, and thus to England, was a problem due to the shallow depths of the Delaware River, and the high cost of freight overseas. At that early time, Russian iron was being sold in England at less cost than that which could be manufactured in Durham and shipped to England. The furnace produced pig iron and forged product primarily for American consumption, and contributed mightily to the success of the American Revolution through the manufacture of shot and shell for General George Washington’s troops during the Revolutionary War. The famous Delaware River Canal passes through the eastern section of Durham and opened in 1832. The canal was a marvel of its time but was short lived as a source for transporting goods as other means of transportation, such as the railroad and the steamboat, became more efficient. Today, Durham has a population of about 1,144 people according to the 2010 Census (approximately a 13% decrease from the prior census of 2000). It remains modestly the same as it was found by the Europeans who first arrived here prior to 1700. 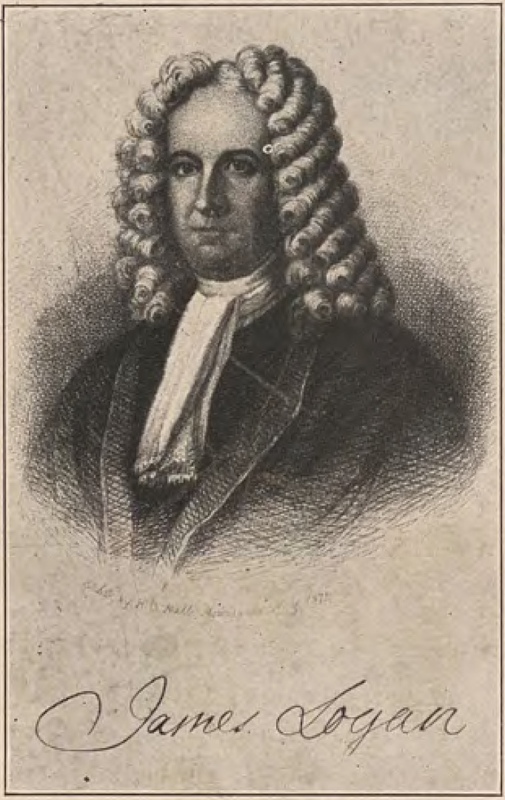 James Logan, William Penn’s original Secretary, became a twenty-five percent owner of the Durham Furnace after a group of individuals bought out the original “FREE TRADERS” in 1727. George Taylor (whose home still stands just outside of the Durham Village Center), through marriage, became an owner of the Durham Furnace. 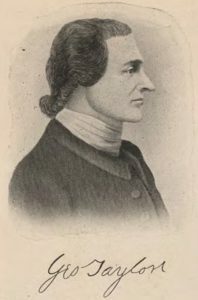 He was also one of the signers of the Declaration of Independence. He is buried 10 miles from Durham in Easton, PA.